how sanitized it would have to be to get a rating that allowed it’s core audience to even see it, the saga of even bringing it to the screen was a tale in and of itself. But, it’s here, the film adaptation of Suzanne Collins’ 2008 young adult phenomenon has exploded onto the big screen for all to see. “Games” is the story of 16-year-old Katniss Everdeen (Jennifer Lawrence) who lives in a dystopian future North America where each year 24 children are forced to fight to the death for the amusement of the tyranical Capitol. 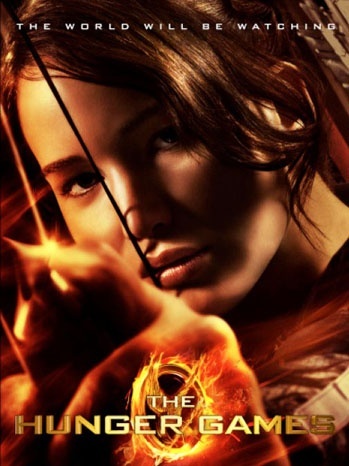 The film follows Katniss (and her fellow District 12 tribute Peeta (Josh Hutcherson) as they train and fight in the brutal funhouse of evil that is the arena. But the story, in the books and the film is all Katniss. Lawrence, an Oscar nominee in 2010 for “Winter’s Bone,” carries this film almost entirely by herself. While the rest of the cast does a remakable job, particularly Amandla Stenberg’s heartbreaking Rue, Lawrence is a the center of it all and handles it beautifully. That Lawrece carries this film, the book being entirely Katniss’ first-person narration, is hardly surprising, but the care with which the fimmaker’s changed that scource material to fit into the confines of a film is sort of amazing. Cutaways provide the audience with explanations of some of the most esoteric plot elements and extra scenes expand the story in a glimpse of things to come in this dark and intense series. The looking ahead that the fimmaker’s have done is clear. Liam Hemsworth’s Gale, best friend to Katniss, has little to do in this first film although as the series progresses he becomes more and more important. The same with the nefarious President Snow (Donald Sutherland) who’s true mania is barely glimpsed in this first film. But, director Gary Ross (“Seabiscuit”) and writers Ross, Collins and Billy Ray have layered enough of them into the film that you understand their importance, even if the meaning behind that importance isn’t entirely clear.